We all love a white shirt, or at least that’s what I thought until my lovely Chloe said she had never bought one - from a curvy girl where buying white shirts was always about the buttons and them never being in the right place, I totally understand her dilemma, as well as not being sure as to which was HER white. Let’s begin with this issue: The Right White. When I talk about a white shirt I am including every light shade from cream, through ecru to brilliant white. I always knew that cream shades washed me out. My first school uniform was a cream shirt, and I remember my mother greeting me at the school gate with ‘How pale/tired you look Trinny’ I now look back and think maybe it wasn’t the late nights, but actually the cream of the shirt. About 15 years ago, the white shirt became my staple, after understanding which white works best for my complexion. If you have a peaches and cream complexion, fair hair and blue or green eyes, a soft cream can look wonderful… even with brown eyes. But, as soon as you get to an olive shade or darker I rarely dress any woman in cream. Brilliant white on olive, caramel and brown skins looks fab... and sometimes on an alabaster white skin. Ecru can be great on redheads with a freckle or two and hazel/green eyes. A great trick for wearing a cream coat that you think washes you out, is to wear a crisp white shirt underneath because it will really help lift that cream from your face with the freshness of white. 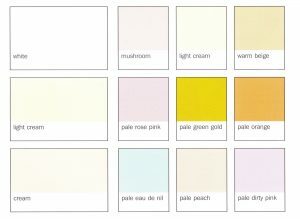 Below is my cream/ecru/white chart from the book ‘What you wear can change your life’. If you have an extra-long or very short neck, consider a round collared shirt, or mandarin collar. I think it’s a far cleaner neckline, and for those with a curvy figure, a white shirt with a slit décolleté front can be extremely white shirt sharp – yet flattering. These shirts are ones that either have some added action at the collar (pussycat bow detail- think COS’s wonderful tied shirts- and abstract tissue rose embellishment of white on white at the collar –in store now) or the drama might be on the sleeve (like Celine’s massive fabric moment on my white shirt). These types of shirts are especially powerful, when you walk into a room, people will notice. It’s that type of shirt that you put on in the evening and feel casual yet cool. There are great ones on ASOS who always have a fluted, or bell sleeved shirt option. You might have got to a stage when you have stopped wearing necklaces at your collarbones like I have because I feel my skin is not so good. However, consider wearing necklaces, especially if they have a cool ornament at the end of the chain and wear it under your white shirt collar where they pop out in the middle for some added colour and interest. You can also add a little bit of detail by taking an old clip-on earring- where you might have lost one- and placing it right in the middle of the collar, or even a brooch and attach at the top over the button. White shirts are fabulous and will always be a classic, yet make things so much more chic and fashionable.